It has become apparent that it is possible for the brakes on some units of the "explorer"TM and "hammerhead"TM strollers to become damaged resulting in the brakes no longer functioning as intended or failing entirely (affected serial numbers are listed above) and posing a risk of injury to the occupant. phil&teds® has received 8 reports of incidents worldwide, however, no injuries have been reported. Neither Health Canada nor phil&teds® has received reports of injuries related to the use of these strollers in Canada. Health Canada is advising consumers to stop using the affected strollers immediately and contact phil&teds® to arrange to receive an upgraded brake assembly. Regardless of any indication of damage consumers are advised to register with ®" href="http://www.philandteds.com/support" href_cetemp="http://www.philandteds.com/support">phil&teds® to receive a replacement frame and self install instructions free of charge. phil&teds® are supplying a replacement stroller frame (with the improved brake system) to all consumers in possession of strollers within the indicated serial number range. "explorer"TM owners will receive a new frame fitted with an upgraded brake assembly and instructions will be provided allowing owners to perform an in-home swap over of the stroller frame. "hammerhead"TM owners will need to take in or send their stroller to a phil&teds® authorized repair center so the brake assembly can be replaced. 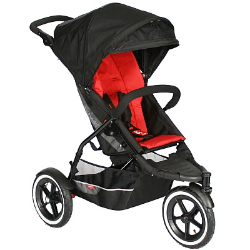 "Hammerhead"TM owners will receive a pre-paid return shipping container in order to return the stroller to phil&teds®. For additional information in the U.S. and Canada, contact phil&teds® USA toll free at 1-855-652-9019 between 9AM and 5PM MT Monday through Friday or visit the company's website . Consumers may also view the release by the US CPSC on the Commission's website .